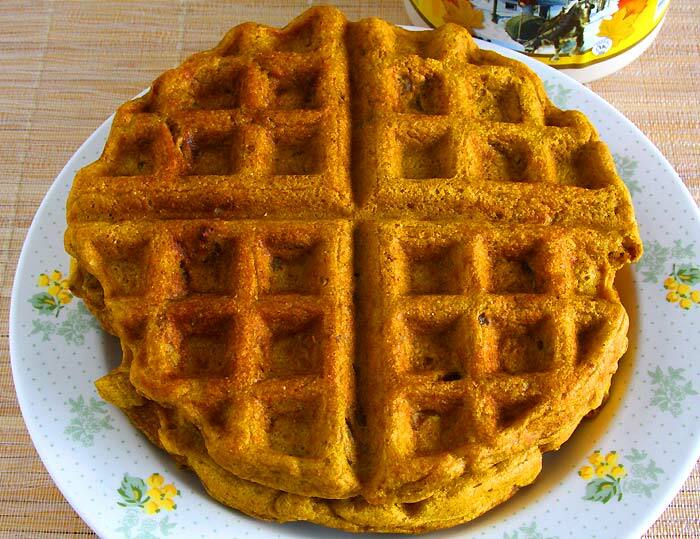 Gluten-Free and Vegan Sweet Potato Waffles: When I first bought a waffle iron to make these vegan waffles, I didn’t think that I will be making waffles as often as I do now and especially the variety of waffles I have made all these years. I believed that the waffle iron like few other of my kitchen appliances will be hiding in one of the cabinets catching dust. Boy, I haven’t been wronger than this before! This sweet potato waffle recipe is a new addition to the never-ending collection of waffles recipes I already have in the blog. 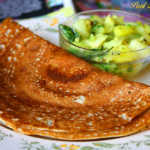 Pancakes and waffles make breakfast so easy, healthy and interesting. 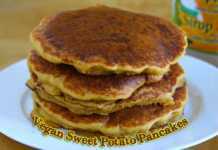 I say these recipes are easy because you can prepare the batter the previous night and whip up some fresh pancakes/waffles the next day morning. It’s also a healthy option because you can use a variety of whole grain flours, mashed fruits and vegetables, nuts and dry fruits and you’ve got your family a well-balanced breakfast to start the day on a high and happy note. Sometimes I also pack it for lunch for the kids and they are quite thrilled to have breakfast for lunch. Recently I have got into the habit of eating pressure cooked sweet potato during lunch for the carbs portion. Weekly once I pressure cook a big batch of sweet potato and store it in the fridge and use it rest of the week. One such week I had some extra and got the idea to make waffles using it. 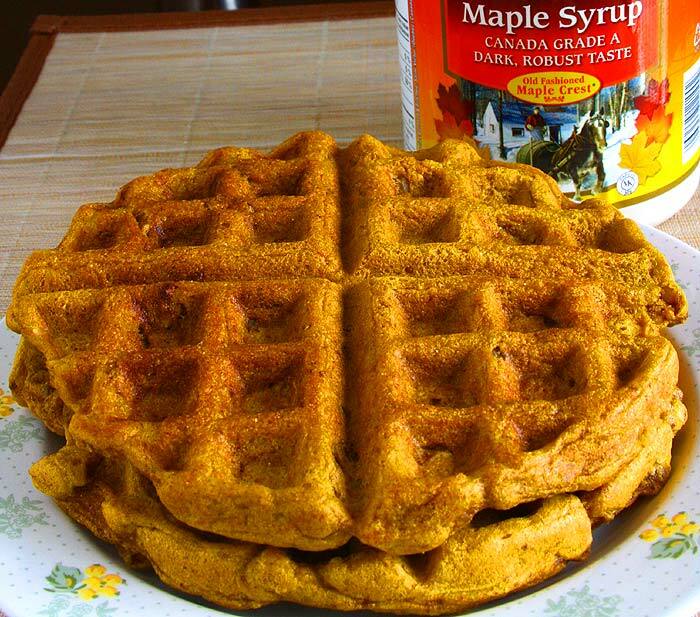 I also wanted to try making these sweet potato waffles gluten-free because I bought this gluten-free all-purpose mix from Bulk Barn recently. I already have a gluten-free waffle recipe made with buckwheat flour but for this one, I used my tried and tested vegan waffle recipe to make these vegan sweet potato waffles. That recipe never fails me. 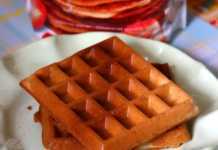 It’s very versatile and forgiving and you can make umpteen variety of waffles using that one simple waffle recipe as a base. Beta carotene rich sweet potato makes this waffle extra special. 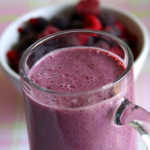 Boost your kid’s favorite breakfast by sneaking in vegetables and set a healthy tone for the start of the day. Spray the waffle iron with cooking spray and make waffles according to the instructions that come with your waffle iron. I had to use about 2/3rds of a cup of batter for each waffle. I was very happy when my husband asked what’s different about these waffles, it tastes like the usual ones. The kids also didn’t feel that it was any different at all. None of them realized that it was made with gluten-free flour. I wasn’t also able to notice any difference in the taste or texture. I can’t wait to get more of this gluten-free mix to make more gluten-free treats. Cornmeal gives a nice crunchy texture to waffles. Although it’s optional I would recommend using it. If cornmeal is not available just use whatever flour you are using for that 1/4 cup too. 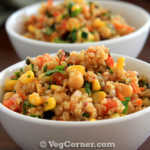 I have tried this recipe with whole wheat pastry flour too and it works great as well. The quantity of milk might vary depending upon the type of flour you are using, so add it in small increments. For the gluten-free mix 1 and 1/2 cups of milk was enough for me. I added a tablespoon of water to adjust the consistency a bit. Whereas the whole wheat flour version required 2 cups of milk. 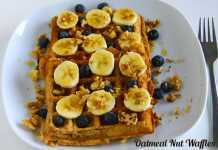 This sweet potato waffle recipe is very forgiving so feel free to substitute any of these ingredients with whatever is available without changing the quantity. 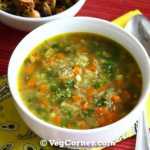 Pureed pumpkin, mashed banana are some of the other things which you can use instead of sweet potato. I have tried it with store-bought canned pumpkin too. These gluten-free sweet potato waffles or any waffle in general freezes well. When you are ready to eat toast it in a bread toaster and you are good to go. I wanted to bump up the nutritional value of these waffles, so I did use 1 full cup of chopped walnuts. 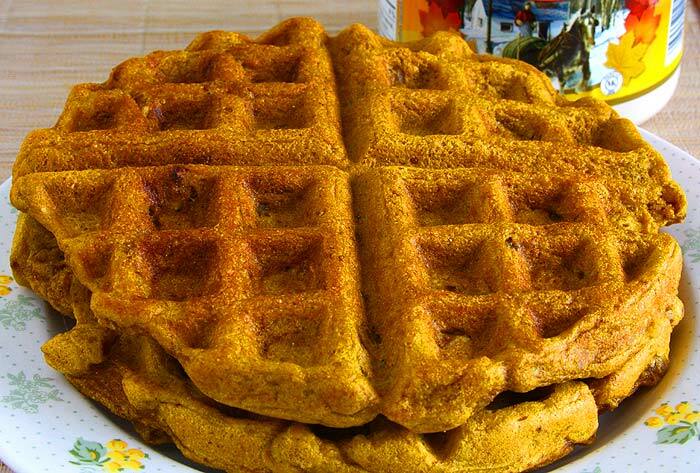 It did increase the protein, fat and fiber content of these gluten-free sweet potato waffles. Choose to reduce the number of walnuts or substitute some of it with chocolate chips.